Here at Talking Bull we are delighted to announce a new edition to our range of products in support of Hereford Football Club. 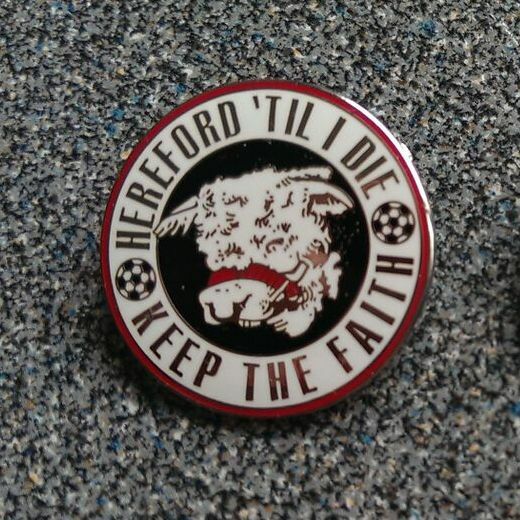 Be one of the first to get your hands on our top quality Hereford ‘Til I Die enamel badges for just £3 each. Our exclusive Talking Bull enamel pin badge is made to the highest standards, and features the popular Hereford ‘Til I Die design. The one inch diameter nickel badge is of deluxe quality with a traditional safety pin fitting. To order just visit our online shop page and buy now! Talking Bull confirms any profits acquired by the Hereford supporters magazine, website and on-line store will be equally distributed between Hereford Football Club and Hereford United Supporters Trust. This will be achieved through direct match and match ball sponsorship at Edgar Street with the funds thus being directed through Hereford Football Club. An equal sum will be donated to the Hereford United Supporters Trust for the specific purpose of acquiring shares towards the fans target. High demand is anticipated so get your order in today.